I made this chicken pesto “noodle” bowl for dinner two nights in a row this past week because it’s that tasty. It’s fresh, cold, light and satisfying. It doesn’t involve the stovetop or oven either, so it’s awesome for summer! If you don’t have any pre-cooked chicken in the fridge already, then you’ll have to cook a little bit, but at least it’s simple. I recommend either throwing some chicken on the grill or poaching it on the stove to get the job done. In a pinch, you can buy a rotisserie chicken too. Also, I know I mentioned it already, but the summer heat has been insane in Portland! It has been consistently in the mid to upper 90s for many days now and it looks like it’s going to continue. So, I’ll definitely be making this recipe again! Place chopped chicken in a large bowl and mix with 2 Tbsp or so of fresh pesto. Place in fridge and let sit for a couple hours. (Note: if you don’t have time to let the chicken marinate in the fridge, skip it, but I recommend doing so if you can, so the chicken absorbs more pesto flavor). Shortly before eating, place the zucchini noodles in a colander and generously salt with sea salt. Place the colander in the sink or over a large bowl and let the zucchini “sweat” for 10-20 minutes. Then, squeeze out any excess water and divide the zucchini noodles among two bowls. Divide the tomatoes between the two bowls and add a little more pesto (probably 1-3 tsp per bowl or to taste). Then, divide the chicken mixture between the two bowls and mix well. Season to taste with a little sea salt and/or pepper, if needed. 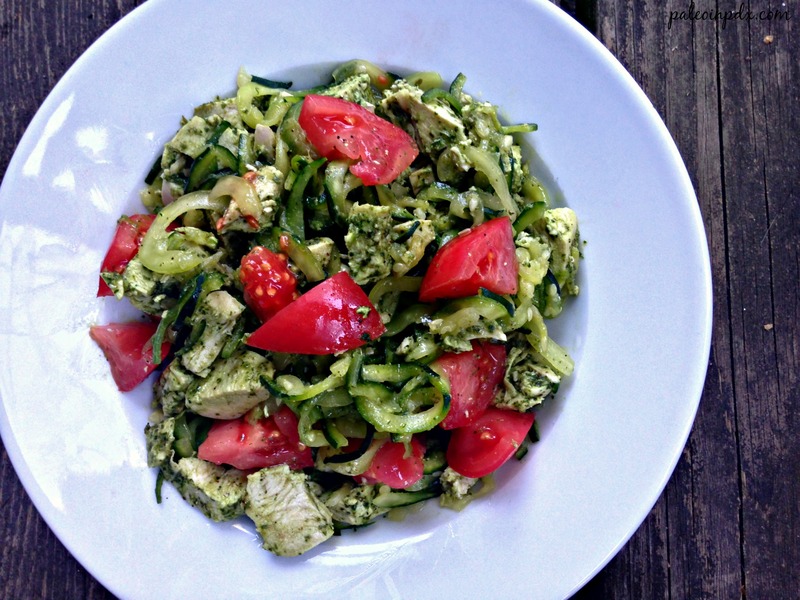 Pesto over zucchini noodles is so good and I love the idea of adding chicken to make it a meal! My basil plants are growing well now so I will be giving this a try soon. Pesto is a great way to use up that basil once it really starts coming in! It makes for a tasty meal too! I think this would be AMAZE with sun-dried tomatoes! For those that like sun-dried tomatoes, I’m sure it would! I’m actually not a big fan of those suckers, but I love fresh tomatoes…especially heirlooms!